This large chair appears to be en suite with a pair advertised by C. Fredericks & Son of Old Brompton Road (trade advertisement, Apollo, June 1970). 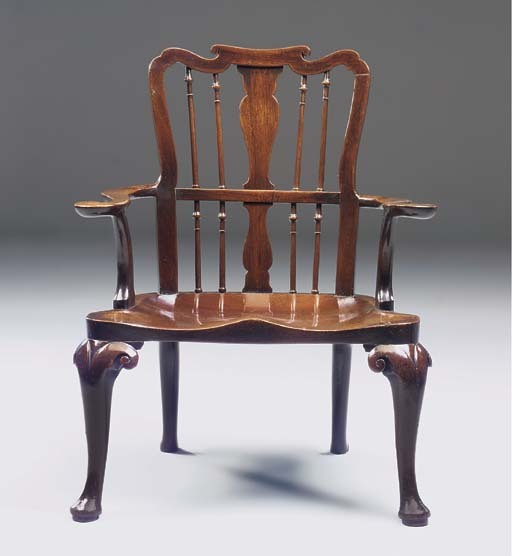 A similar chair, with additional spindle in place of the vase-capped baluster splat was exhibited by Witney Antiques at the 1997 Grosvenor House Art and Antiques Fair. It also relates to a 1750's 'Slough' or 'Windsor' chair by Richard Hewett discussed in Nancy Goyne Evans, 'A History and Background of English Windsor Furniture', Furniture History, 1979, pp. 24-53, pl. 84).